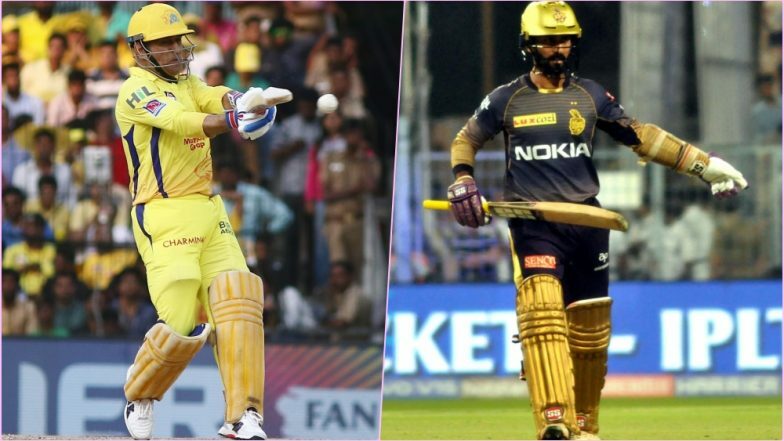 CSK vs KKR Head-to-Head Record: Ahead of IPL 2019 Clash, Here Are Match Results of Last 5 Chennai Super Kings vs Kolkata Knight Riders Encounters! Top slot in the 2019 Indian Premier League (IPL) points table is up for grabs as two of the finest teams – Chennai Super Kings (CSK) and Kolkata Knight Riders (KKR) in the league battle it out. With four wins in the competition each, Kolkata and Chennai have been doing well in all three departments. A clash of this magnitude generates a lot of buzz and understandably so as some of the top stars of the game are in action. With the two teams coming on the back of confidence-boosting wins, a one side contest can be ruled out. In terms of head to head record, both these franchises have played each 21 times with Chennai winning 12, Kolkata 8 and one game produced no result. This is how their last five meeting unfolded. CSK vs KKR, IPL 2019 Match 23 Preview: Battle Royale on Cards As Kolkata Knight Riders Take On Chennai Super Kings. A decent performance with the bat for the Chennai Super Kings where everyone chipped in with runs helping CSK reach 177/5 batting first. MS Dhoni remained not out on 43 off 25 balls to provide some much-needed aggression at the tail end. In reply, KKR got to the total with relative ease thanks to Shubman Gill and Dinesh Karthik who scored unbeaten 57 and 45 respectively. An absolute carnage by Andre Russell who hit a 36 ball 88 which included 11 sixes went in vain as Chennai Super Kings chased down a massive total of 203. Shane Watson provided a solid start for CSK while Sam Billings late strikes put his team in a comfortable position. When Ravindra Jadeja and Dwayne Bravo came in the middle, the game was already done and dusted by then. Veteran spinner Brad Hogg made good use of the spinner friendly Eden track to pick up 4 wickets and restrict Chennai to a below-par total of 165/9. A few batsmen from CSK like Dwayne Bravo and Brendon McCullum did get starts but failed to convert them to a big score. Kolkata’s response was smooth with Robin Uthappa playing the anchor role with a well take 80 and Andre Russell finishing off things at the end with 55. There were not many who had given CSK a chance when they set KKR a target of 135 to win the game, but quality spells from Dwayne Bravo and R Ashwin turned the game in the home team’s favour. The last five wickets for Kolkata fell in the space of runs as they were restricted to 132/9 in 20 overs. The final of the T20 Champions League saw KKR clash with CSK in Bangalore which MS Dhoni’s team won with ease to lift the title. Chasing 181 in the summit clash, Suresh Raina hit a century to hand CSK the title in a one side clash. KKR could only manage two wickets as their bowling unit crumbled. A tough game to predict but the captain who uses his spinners well in the contest is most likely to come out on top.